Adjusts air pressure at the air tool. Ideal for spray guns to avoid costly painting errors such as poor color match, runs, poor coverage, orange peel, etc. 1.Mini Air Regulator is the essential tool for any spray gun or compressor to regulate the air input. Fitting directily onto any conventional, HVLP or LVLP gravity feed or suction spray gun, this is a must have. 2.A perfect tool for Automotive Refinishing, Marine, Construction, Woodworking/Furniture making and all industrial work. Whether you are the enthusiastic amateur or the professional. 3.Regulating your air input allows you to set the correct pressure whilst spraying, this will save your time and provide you with the control and ease of your workflow. 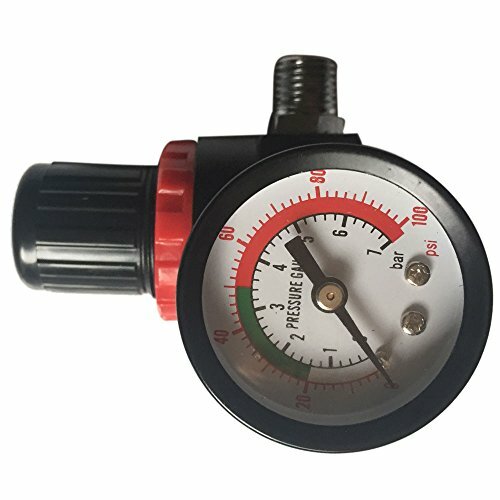 4.Suitable for all other air tools that require and accurate pressure to operate.